Juventus joins a list of phenomenal comebacks in the Champions League this season as the Turin outfit came back from a two-goal first-leg deficit to progress to the quarter-finals of the competition. The Old Lady registered an incredible 3-0 win over Atletico Madrid on Tuesday night, with Cristiano Ronaldo proving once again why he was brought to the club. The Portuguese ace netted all three goals for the Bianconeri which included a dramatic penalty in the 86th minute of the game. The treble marks his eighth hat-trick in the Champions League, thereby equaling Barcelona star Lionel Messi's record in the competition. The hat-trick also helped Ronaldo become the first player in history to score 125 UEFA club competition goals. Records aside, Ronaldo's cheeky celebration after he completed his treble has attracted the attention of fans worldwide. After scoring his third goal, the 34-year-old forward went over to the away fans and mimicked Atletico coach Diego Simeone's celebration during the first leg of the fixture at the Wanda Metropolitano Stadium. Simeone was given a €20,000 fine by UEFA for the celebration and it is likely that Ronaldo will receive a similar punishment. "Surely he was thinking about his people when he did it, like me at the Wanda, saying they have personality." "Cristiano is one of the best in the world, it is normal that he can play how he has done tonight." Simeone added that Juventus deserved the win as they were simply better than his team. "They were better than us and we have to compliment them. We tried to play our game. In the first half we played well, but in the second we didn’t manage to make anything to get us through." "Honestly, I’m calm and the players did well this week. In the first leg we played well and hurt them. Tonight, things went wayward. We didn’t manage to counter their performance." 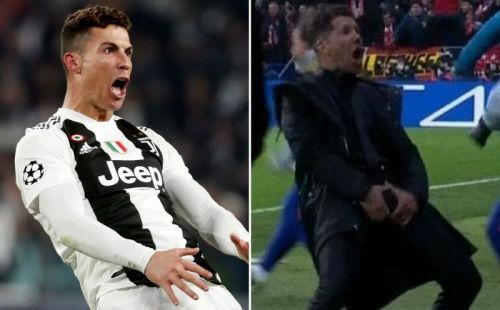 Cristiano Ronaldo does the same celebration Diego Simeone did just last week against Juventus. Is this celebration familiar to you huh? How many goals that atletico madrid scored tonight?